Morphon, Blighted Mind is a Taken Hydra encountered in the Paradox Story Mission. It was tasked by Oryx to seize the Vault of Glass and co-opt its power, all the while blighting and corrupting the Vex network. Luckily for the Vex, Morphon was destroyed by Guardians. Morphon is the only boss of its mission, but when players seek to find its secret ending, is first before the Blighted Descendant. Morphon will spawn after the player jumps into the Gorgon's Labyrinth being a corner, where the Mind and a few Taken Vex will be spotted. Note that Taken Hobgoblins will appear throughout the labyrinth on upper ledges. Damage Morphon long enough, and it will teleport further into the cavern. It's best for the player to defeat the enemies that spawned first before targeting the Blighted Mind. Morphon will repeat barraging the player with its Aeon Maul, teleport, and summon enemies two more times before, when found the fourth time, will be immune to all damage. To be able to harm it, the corrupted Oracles around it need to be destroyed. when all is destroyed, Morphon will become vulnerable for the player to attack it. Morphon will also be detain you once in a while, so, when trapped, simply fire at it until it pops. Repeat the same proccess of destroying its oracles and damaging Morphon, Blighted Mind until it perishes. 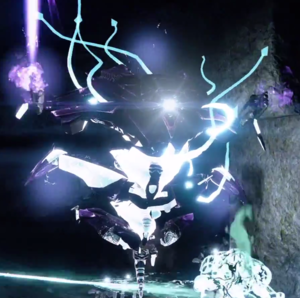 According to Morphon's abilities, it's concluded that it could've been a vex entity that was previously dormant in the Vault of Glass before Oryx arrived at the Sol System. Unlike Atheon's red Oracles and the Templar's yellow Oracles, Morphon's Oracles are green in color. In addition to this, the Taken Hydra's oracles are the only ones that don't act a death mechanisms, but act as shields.